Highlight quotes from web pages and it remembers the source of the copied text. When not in use it slides out of view or can be minimized to the tray icon. settings will writ to an ini file instead of the registry. an app data folder for back ups of its data base. Even when run from a USB device it does this as well. Which is what the JPE Launcher is really for. (or if you just want to keep your backups close). 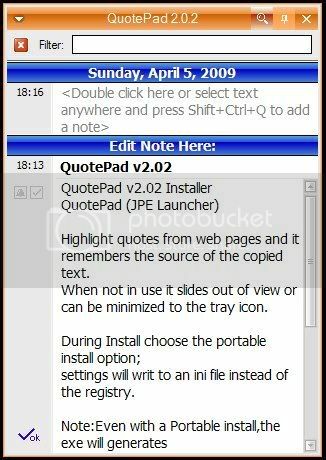 QuotePad runs under Windows 2000/XP/Vista and has a multilingual interface. QuotePad has been abandoned long time ago- the latest version was released on 11.06.2009. However at least the final version seems to be fully portable- it offers 'Install in portable mode' option. QuotePad saves its settings in 'quotepad.ini' file inside its own folder and all its data is stored there as well. smaragdus wrote: the latest version was released on 11.06.2009. However at least the final version seems to be fully portable- it offers 'Install in portable mode' option. Personally, I prefer "uniextracting" the installer. Do you get an empty folder at \AppData\Roaming\QuotePad\Backup ?